Update: this post has been viewed more than 2,000 times, but no-one left a comment. It took me 2 hours to write it and it will only take you 2 minutes to leave a comment… what are you waiting for ? 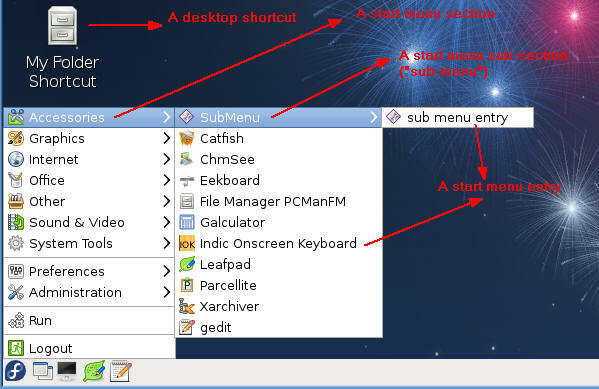 Note: if you want to instead create a new start menu section or sub-sections (ie: “sub-menus”), check this post. Adding start menu entries and/or desktop shortcuts (launchers) in LXDE is certainly not as easy as under Windows. I’ve recently installed the cool hardinfo tool which is an application that lists all your computer hardware. Unfortunately, the hardfo installer doesn’t add any menu entry in the LXDE start menu (I’m talking about the one that is displayed when you click on the button located at the bottom left of your desktop). OK, let’s add a menu entry for hardinfo by ourselves. Creating a new menu entry simply means creating a new .desktop file. The format is detailed here or there, but you can choose to use the existing .desktop files that you have as a template. Since .desktop files can be located in 3 different folders, which one should you use ? I suggest that you create your .desktop file in the ~/.local/share/applications folder. This way, the shortcuts that you create will not impact other users. It uses different command line options to create (-o) and to edit (-i) .desktop files. There is no way to edit the category name (ie: “where the entry is going to be located in the menu”). For all these reasons, it’s just easier to use a text editor to create your .desktop file. As you can see, the ‘Exec’ property contains the location of the ‘hardinfo’ application. By default, your new menu entry is part of the ‘Other’ category. What if you want to put in another category ? That’s where the ‘Categories’ property comes into play: valid values for this property are listed here. To add a shortcut on your desktop, right click on an existing menu entry and choose the ‘Add to desktop’ option. This means that if you want to create a desktop shortcut for an application that is not in your start menu, you just need to create a .desktop file in $HOME/desktop, as explained in the previous chapter. Alternatively, you can right-click anywhere on your desktop and choose the “Shortcut” option: this will launch the “LXShortcut” tool. This time, right clicking on your desktop and choosing “Create new > Shortcut” will not work since this can only be used to create application shortcut. To create a folder shortcut, you need to manually create a .desktop file in the ~/Desktop folder. Basically, we are are just asking pcmanfm to open the “/home/laurent/Documents” folder. Also, I’m using the pcmanfm “system-file-manager” icon, but you can choose to use any icon that you want. 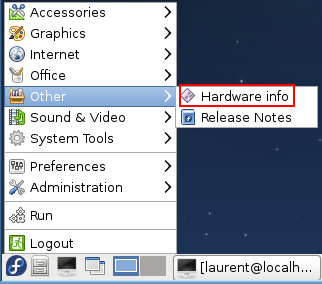 OK, one more LXDE madness: it looks like the icons can either be located in /usr/share/pixmaps or in /usr/share/icons. Thanks a lot for the nice and extensive how-to. I used the methods described and I could add 99% of the programs. I say 99% because I have a “pesky” application that simply will not run from the main menu. It is a java program that has been installed inside my home folder. The exec path is /home/myname/Java_Program_folder/java-app. Do I need to do something special to get Java programs start from main menu? Is it a command line application or is it a graphical one ? I think you need to add the folder where the java program resides to your PATH variable. Code would be: PATH=$PATH:/home/myname/Java_Program_folder/java-app. This makes scripts/bins in the java-app directory executable for the session, and it would be pretty straight forward to make this a script and place it in /etc/rc.local. You could also edit the file that creates the PATH variable, but I’ve read that’s bad practice. Hey thanks for the great article -very useful! Grateful thanks for this information, I have been looking for this to put it in my Raspberry Pi, where learning linux is a necessary evil. Thank you for putting this article together which is the most comprehensive guide I have found after endless searching for help on this topic. In particular I have been trying to modify the main menu on my Raspberry Pi, following the tips in section 1. However I have had some glitches with the process, which probably means I have overlooked something. Tried adding an existing desktop I had creaated saving it to the home/pi/.local/share/applications folder (I first needed to select ‘show hidden files’ in file manager to find the .local/share/applications folder). I take it that this is the folder referred to when you say ~/.local/share/applications. Clicking on this created shortcut opens file manager but then specifically opens the contents of any USB stick plugged into the RaspPi. This works fine when running on the desktop. However when I rebooted, and restarted the XDE desktop, I noticed that the file manager icon next to the Start Menu (in a similar location as the taskbar in Windows) had been replaced by my ‘USB shortcut’ and File Manager had also been similarly replaced in the Accessories section accessed from the Start Menu. Both shortcuts worked as they should (opening the USB drive), but I had then lost the file manager icon. Thinking that either one of these was probably causing the problem, I commented both lines out and re-booted – However the problem persisted. I also tried re-inserting the line Categories=Graphics to see if the icon moved to a different location than accessories. However still no luck. Finally I removed the ‘.desktop’ file from the folder ~/.local/share/applications upon which all returned back to normal. – “~/.local/share/applications” means “the /.local/share/applications folder that is located in your $HOME folder”. – have you tried following step #3 of my post above ? Can you post a copy of your .desktop file ? Basically its a modified File Manager ‘shortcut’ as you can see from the commented line #Exec=pcmanfm %U. I changed the Exec line to open the USB drive in the /media directory (see note below). The icon referred to is one I found that looks like a USB drive. The rest is pretty standard. When copying this to the .local/share/applications folder, I tried commenting out the Categories and the MimeType, in case these were causing the problem but it did not seem to have any effect. Would the fact that the file is called pcmanfm.desktop, have any bearing on the issue.? Ha ha, that’s great ! If you OK with it I would like to post a link to this page from the other forums I have been to, as this has been the best guide I have come across for ‘shortcuts’ in LXDE. where the coded name after media/ is the name given to a particular USB stick. Where the same stick is used each time this line works, but falls down if a different one is used, since the coded reference alters. In short what I am looking for is a wildcard of sorts that would replace the coded name and open any folder found beyond media/. I can get this to work at command level using something like ls * /media, but this does not translate in the LXDE environment. I’ve got the same problem as shawn except with Sauerbraten. The file suaerbraten_unix resides in /home/Games/sauerbraten/ and I can launch it successfully from the command line when in the directory. I’ve discovered as writing this, that Sauerbraten as I’ve compiled it looks for files via relative paths, so if I call the sauerbraten_unix binary from any other location than the directory in which it resides, then the program complains about not having a certain file. When adding the sauerbraten_unix file to the desktop menu using lxshortcut and then running it, I did not get any feedback about the error that was occurring. I have tried setting the path variable to ~/.sauerbraten and to the home directory of the suaerbraten client, but I get the same error message as when I run the client from any other directory (the error message complains that I have no native client installed and requests that I run make install – but I have already done this successfully). I suspect a compiler flag of some kind or possibly some sort of compilation complication due to running selinux (which I have no experience with). If anyone knows how to solve this then I’d be grateful. Many thanks. Thanks for this. Used it to add a start menu entry to the Internet section. When I add entry e.g. for Eclipse and run it, ‘init’ becomes the parent of this process and its environment in not what I want it to be. How can I create desktop entry that gives the behavior as if I started shell, it sourced bashrc file and then eclipse were run? Thank you very much I have been looking to create another category and then multiple sub cats. Ok so I created an entry in the start menu then created a submenu but how do I add programs to the submenu? Thank you for the provided information, very useful for beginners. Unluckily for us, there is a lack of information about how to make basic functions (that are automatic in other disros) work in PCManFM and LXDE. Thanks for writing this excellent tutorial. Your blog posts have been really helpful to me as I have started packaging my first homemade Raspberry Pi program called “Mission Control”. It is really nice to be able to create my own LXDE .desktop shortcuts, and menu items! Thanks – very handy. Note to anyone patching a /desktop file. In order to associate an icon, add the absolute path to the icon, then do the ‘lxpanelctl restart’ shoukl work great ! still damn useful months later 🙂 – thank you. Thanks!!! Just what I was looking for. I’d like to ask you about a specific issue that I have. 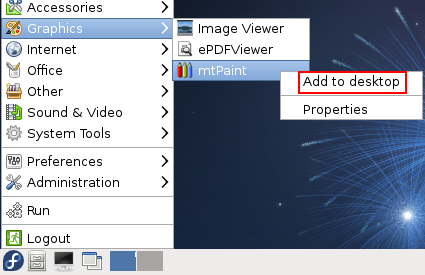 When I create a menu entry for the ImageJ application, the shortcut can’t remember the work folder (“Path=”), so the software doesn’t show the plugin (because it can’t find this location, I guess). It doesn’t occur when the shortcut is on the desktop. Awesome article because although it has tons of useful information I was just dealing with a client that wanted his Lubuntu install to have desktop shortcuts of the main installed apps and you have a screenshot of explaining that by right-clicking on a menu entry and selecting “add to desktop” it will create a shortcut. Many many thanks man. Sometimes simple is the best. Thanks a lot for the nice and extensive how-to. Thank you for your how-to. Nice job. Hi Laurent, thanks for your blog. Eventually have you stayed on LXDE ? Thanks a lot! It solved my issue. Well written, easy to understand, many thanks, much appreciated. Thanks a lot for sharing this! So far yours is the easiest way to follow! Thanks for this article. It really helped me, this method is so simple and it really works. Thanks much. I’m having a little trouble getting the icon into right category. Thank you for your time in putting this article together. I hope at some point to be able to do a write up as good as this in the future! Great Info – Thanks for your efforts! Does anyone know how you would go about opening the lxde start menu using the Super key? Thanks. Saved this for reference. Thought I’d share my experience with the lxshortcut GUI. I used it to put icons on the desktop as I prefer to use a graphic utility where possible. Managed to put the links I wanted on, but noticed a bit of weirdness and had two problems. 1. Couldn’t get back into the links to edit them with lxshortcut -i, because I couldn’t remember the full name of the file that I had entered when calling lxshortcut -o and the file utilities and properties window only show the chosen display name. 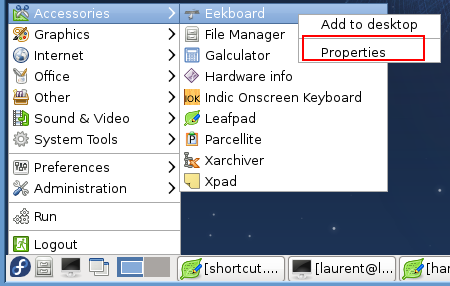 Solution: right click on one of the shortcuts and set the “open with” property to lxshortcut -i. Then this option for opening will appear when you right click any of your shortcuts so you can edit them with the lxshortcut GUI without remembering the name. Of course you can also get the name by calling ls within ~/Desktop from the command line. Strangely, if you choose rename from within the File utility, it will open a dialog displaying the real name and allow you to rename it without changing the display name. 2. Couldn’t find an icon for Thunderbird. Solution: from the command line enter “locate | grep icon” and a list of all directories with that icon will come up. Navigate to one of them in the lxshortcut change icon window and select the icon you need. I’ve now got a working set of shortcuts on my desktop. The day is little brighter when the first result you find in Google is a page like this! Excellent! nice work than you very much! Great GIG , worked like a charm ..
Great article and exactly what I was looking for. Followed your tutorial and the result is as expected. Excellent! Exactly what I need. Thank you very much for your post, it was really useful! Thanks for your help. Very good post and self-explained. Your write-up is great and very helpful! Your contribution is helping thousands of people become more proficient in the LXDE environment. You are making the world a better place for everyone. Thank You! Found this site after lots of googling for lxde menu editing and reviewing lots of useless sites. This site is the first one that really makes sense – very detailed and to the point. You did such a great job writing this up. It is informative, well written and absolutely beautiful. You solve our un-knowing so well that we move on to the next issue of un-knowing with some relief. I would think most people who view this post have benefited from your work. I understand we need a little feedback sometimes and I gladly give it as I have benefited from this post. Write for the love of writing and hope of helping others … your good at it. Not sure if it’s been mentioned, but the text files in /home/pi/.cache/menus look like they’re connected with the ‘Menu’ entries; couldn’t you add entries to this instead? P.S. I’m a Linux newbie! I tried deleting the files in /home/pi.cache/menus and found that entries still appeared. Eventually found that /usr/share/raspi-ui-overrides/applications also contains .desktop files that clash with or add to /usr/share/applications etc. Going to try using /usr/share/raspi-ui-overrides/applications as my folder of choice for the .desktop files and remove all others. Will report back if I find any issues. Thank you for this post it explains things clearly. Another way I’ve found to do this is use a program called Alacarte. A lot quicker/easier to use as it’s all done through a GUI. It can create new menus, new items in an existing menu, add/remove separators etc.. It should work in any desktop environment that follows the freedesktop.org specifications. EXCELLENT!! I have looked all over for this info. Very well written and explained. cheers for the info, however I still find it a PITA (cognitive decline etc…) . Yeah, great! Works like a charm, thanks very much! Thank you. Unless it is was overlooked, there is surprisingly no menu entry or way to create this. hi does anyone know a way to get a search through the application option like gnome or KDE has. I think it is very useful, but I can’t find anything on this topic online. Nevertheless I am super happy with LXDE. Hey does anyone know how to get a search function for LXDE to search through applications like gnome or KDE has? I really like LXDE but i miss this searchfunction. Of course you can search in / for files and get .bins, but I would love to have a gnome/kde like searchfunction. This post is great and It goes to the heart of some things I’m struggling with right now. I have the latest Debian Stable Version (09/19/2016) with LXDE as the only desktop environment. What is missing, what I am struggling to solve here is that when I right click my Desktop Area, I don’t get a Shortcut option to launch the “LXShortcut” tool as you show here in this article, implicitly saying that it is available to every LXDE. My LXDE doesn’t show a shortcut option! The CREATE NEW option, when I right click the desktop, it only shows a NEW FOLDER option! That really bothers me, because I use this easy way to create shortcuts a lot, specially to create command shortcuts icons to run windows apps through Wine Application. For example, If I need to run a command like “wine file.exe” a lot, then I create a shortcut in my Desktop, using the Shortcut Tool mentioned in this article, to create the shortcut with a command in it implicitly. 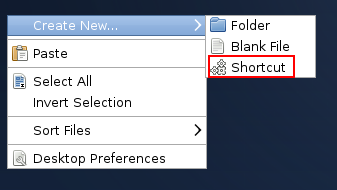 Without this shortcut when I right click the Desktop, things get slower, more work is needed and I can’t understand why this basic option is not present in my LXDE!!! Can you offer any kind of help in this matter that is directly related to your post? Left comment: Created runnable .desktop file in applications directory, restarted panel, restarted computer, DOES NOT WORK. I’m using Lubuntu 16.04 and I have installed it for several of my customers. Overall it’s great but the inability to easily create a shortcut to a file or a URL is a significant shortcoming when compared to Windows. The inability to easily create an ‘Internet shortcut’ to a URL by dragging and dropping from a web browser to the desktop. Microsoft went backwards when they created Edge without this ability and LXDE/Lubuntu even worse because you can’t even right-click on the desktop to crate a shortcut and and then paste in the URL. Just the information I needed. Thank you so much. Great info. Works for me. You’ve earned lots of Good Karma! May the force be with you….